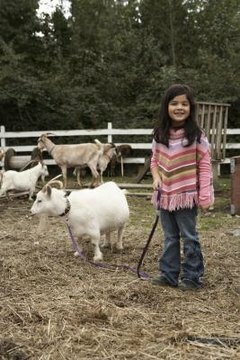 Although it’s normal for you to be anxious as your pygmy goat’s labor approaches, do your level best to remain calm. Goats have been kidding without human assistance for quite some time now. The pygmy goat gestation period is usually between 143 and 157 days. A normal labor typically spans about five hours. Begin keeping a close eye on your doe about 10 days prior to her due date so you’ll be ready if the kid prefers an early arrival. The mother-to-be will exhibit definite physical signs about 24 hours before the onset of labor. The long, firm rump muscles on either side of her spine will slacken so much that you may not be able to feel them and the large tendons around the tail head will relax. Her udder will look as if it might burst as it fills with colostrum. Her teats will also enlarge, fill with milk and look shiny. You’ll see noticeable changes in your doe’s behavior. She’ll paw the bedding in her attempt at nesting, seem nervous and restless, and may repeatedly lie down and get back up. She’ll be more vocal than usual and may talk to the sides of her belly. The doe will pass a thick, whitish plug of mucus which lubricates the birth canal for easier passage of the kid. Her water will break shortly and she’ll give birth about 30 minutes to an hour later.